Next week, Brussels will hold two important events: the EU–Kazakhstan Human Rights Dialogue at the EEAS on November 20th, and the Human Rights Week at the European Parliament from November 19th to 23rd. On this occasion, let’s make our voices heard! On 20th November, the Open Dialogue Foundation is organising two events to raise awareness about human rights violations in Kazakhstan. First, a public protest in the heart of the European quarter to reach out to EU officials and media. We invite you to join us at the demonstration on 20 November 2018 at the Schuman roundabout, from 13.00 to 14.00. Second, a flash mob by MEPs to demand the liberation of political prisoners. 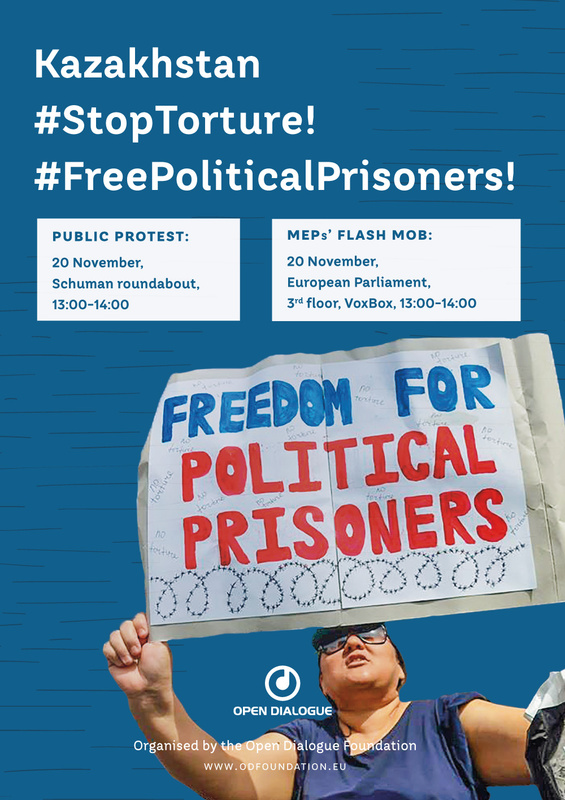 It will take place in the European Parliament itself, at the VoxBox, 3rd floor, from 13.00 to 14.00. MEPs will hold up pictures of the victims and make statements in their defence. We are inviting journalists to attend and spread the messages. Unfortunately, in spite of the very active stand of several MEPs to defend political prisoners and to call for an end to the use of torture in Kazakhstan, this year saw an increase in the number of cases of politically motivated criminal prosecutions (more than 42 persons registered, to date). Now is the time to call for concrete action from both sides. The blatant violations of civil liberties and human rights in the country are clear for all to see. The deprivation of the right to a fair trial, the systemic use of torture in detention facilities, the lack of investigation into allegations of torture – all these evoke grave concern, as evidenced in cases of political prisoners such as: Maks Bokayev, Iskander Yerimbetov and Aron Atabek, as well as Mukhtar Dzhakishev, who may die at any moment. Very often, political prisoners are held in isolation and denied visits from international observers.Kazakhstani authorities jailed blogger Sanat Dosov just for criticising Russia’s illegal actions in Ukraine. The Foundation has reported more than 150 cases of politically motivated persecution connected to the ban of the peaceful “Democratic Choice of Kazakhstan” (DCK) opposition movement. Activists, bloggers and relatives of the regime’s critics face long prison sentences and are subjected to unfair trials. Among them, we recall the victims of the Kazakhstani authorities’ fight against the DCK, such as Ablovas Dzhumayev, Almat Zhumagulov, Kenzhebek Abishev and Aset Abishev. Silence towards such practices by the highest representatives of the EU is no longer acceptable. The Kazakhstani authorities must comply with their international obligations in the field of democracy, human rights and rule of law. Join us to speak out against authoritarianism and stand up for human rights! Make your voice count in saving lives!